You can be sure that if your tarantulas gets a chance, she'll escape her habitat to go exploring. Once your tarantula is out, she faces an array of threats, ranging from local carnivores to household chemicals to your neighbors, who may take drastic measures if your gigantic spider appears in their kitchen. As soon as you notice your tarantula is missing, close all doors and windows leading to the room that hosts the tank, to stop her from leaving the room if she hasn’t done so already. If you have other pets, especially cats or dogs, put them in their crates or in a room that you are sure doesn’t contain the tarantula. 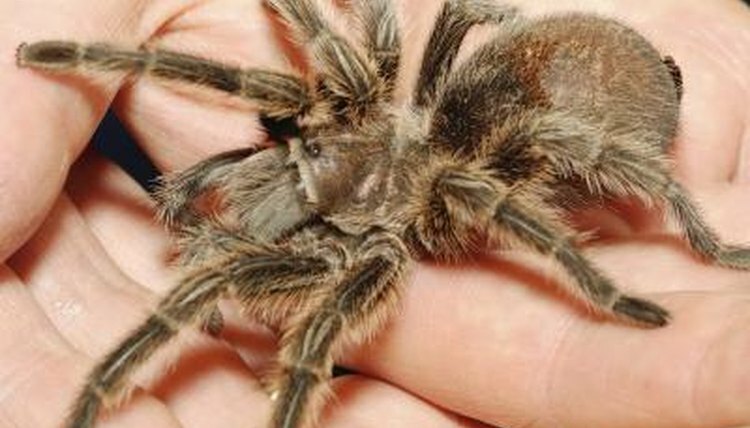 If a cat or dog tries to catch or play with the tarantula, both parties could get hurt. Check the immediate vicinity of the tank, especially inside and under things, as your tarantula might not have gone very far. If that doesn’t produce a result, search the entire room, using a flashlight where necessary, before moving onto the rest of your home and property, moving further away from the tank room until you've searched everywhere. In general, spiders are going to look for dark hiding spots. If she's a tropical species and your house is cold, she may look for warmth or moisture, for example in the bathroom or behind a heater. Focus on high places if she belongs to a climbing species and underneath furniture if she's a ground-living tarantula. Phone, text or speak in person to your neighbors if you can’t find your pet quickly, explaining what has happened, that the tarantula is relatively harmless and what to do if they see her -- contact you and, if possible, put a container over the tarantula. If you still can’t locate her within a day, contact animal control and prepare notices to inform your neighbors that a tarantula is loose. On the notices, make it clear that your pet is not especially dangerous but should not be picked up, and provide your contact details including phone number and email address. After her adventure, the tarantula is likely to be excited and may bite or fire irritating hairs at you, so don’t try to pick her up with your bare hands even if she is normally placid. Instead, trap her carefully placing a plastic box or tub over her and slowly sliding a piece of cardboard underneath. If she’s scuttling about all over the place, an aquarium net might come in handy. Put the temporary containment in her tank and let her crawl out in her own time. If she managed to get the tank open by herself, you need a better-fitting lid. In the meantime, tie or weight the lid down. If your pet makes a habit of escape attempts, consider getting a larger tank and enriching the habitat with hiding places in the form of large pieces of bark and hollow logs. Since some species like burrowing, provide a deeper layer of substrate, up to half the height of the tank.